Clay Floors in Dallas is a professional flooring contractor serving the Dallas and North Texas communities for over 30 years. Floor Restoration, Refinishing & Installation is required in every type of contracted flooring, so if you are considering buying a home with Saltillo flooring, Clay floors would like this opportunity to let you know some advantages for this beautiful flooring. This tile in the above picture is only one option offered in the USA by Armstrong Flooring. Most stores and manufacturers of Saltillo style flooring are varied, and have so many beautiful options to choose from. Saltillo could be the best choice, and surprisingly has the advantage of helping people who have allergies being much more long lasting than carpets, linoleum, Pergo or even some wood floors. Keith Clay discusses some other benefits of Saltillo tile you will definitely find interesting. Education about the products we sell, and install is critical to your location. So why not consider these items before you buy. All-Natural Product – Saltillo is made from clay found in the Northern Mexico area of Saltillo, is formed into tiles, dried in the sun and then fired in kilns. The positioning of the tile in the kiln determines the range in color from yellow to red with many tiles having a mixture of those colors. Saltillo Tiles Are Hand Made – Because the tiles are left to dry outside, you may see bug prints, the footprint of a dog or child which makes for a wonderful conversation piece in your living room. Saltillo Tiles Feel Good on Feet – Since these tiles are made of clay, they are environmentally friendly and feel soft on your feet. Saltillo is warmer on bare feet in winter than ceramic tiles, and are cool and comfortable in the summer. Saltillo Tiles Wear Naturally – Softer than ceramic tile, they do need to be sealed before they are installed. After installation, they can be re-sealed if you like. They are just as beautiful if they are allowed to wear naturally. Saltillo tiles have been made in Mexico and the Southwest for hundreds of years and many public places in those areas have wonderful Saltillo which has been allowed to age naturally. 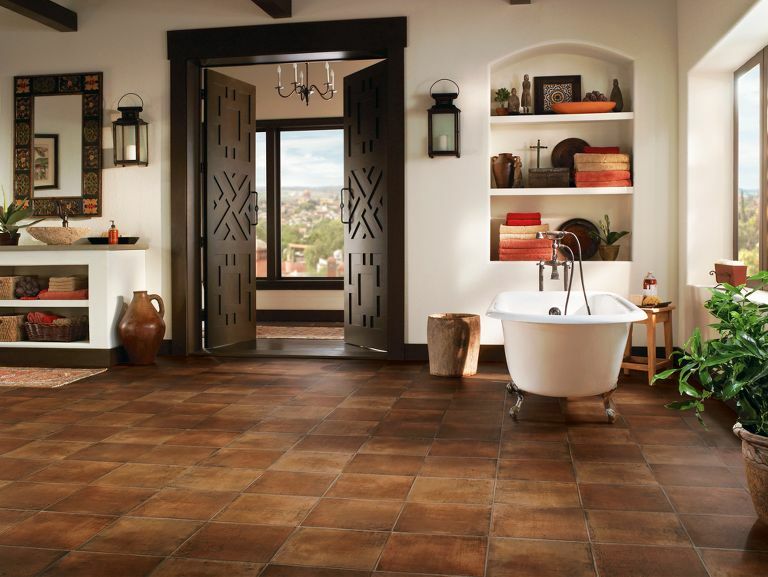 Saltillo Tile Hides Dirt – The warm brown color of Saltillo tends to hide the dirt. Even if a Saltillo floor is dirty, it can be hard to tell. That is a strong advantage for families with young children! Care & Maintenance – Just Vacuum Sweep & Mop: In most cases a quick vacuuming or sweeping is all that a Saltillo tile floor needs to make it look fantastic. When dirty or sticky, mop with water, diluted vinegar (1 part vinegar to 10 parts water), or a floor cleaner made for clay tiles. Saltillo Tiles Can Be Re-sealed for Shine – Your Saltillo can be shinier by a reseal every year or two. Re-sealing is optional and you may not even need it except in high traffic areas. Some Saltillo floors last more than 5 to 7 and have not been resealed. Remember that Saltillo tiles are very unique. If different is important Saltillo is a very valid consideration for all Southwestern, Mediterranean, or French styles. These types of decor can enhance the beauty of these versitile tiles. Customize with Talavera, and these hand made painted tiles follow patterns which have been used for more than a hundred years. Creation of your own art and style instills a sense of history that can identify with your own creative taste. Keith Clay Floors works with almost any kind of hard surface flooring product including the beauty of Saltillo flooring. From hardwood floors the ceramic tile floors, from Mexican tile floors to brick floors, from marble floors to polish concrete floors Keith Clay has been in business for 30 years serving Dallas, Frisco, Plano, Richardson and all Dallas Metroplex suburbs. We know floors and flooring products and can answer any questions you may have. If you want the best job from a company of professionals, call us today. 972-463-6604.